“Drivers hauling hazmat may no longer cross a highway-rail grade crossing unless there is sufficient space to drive completely through without stopping. This rule was made in collaboration by the Federal Motor Carrier Safety Administration (FMCSA) and the Pipeline and Hazardous Materials Safety Administration (PHMSA). The rule change had been considered since 2011, but it was only recently that this regulation was put into effect for haulers of various toxins, hazardous materials, and other similar agents. 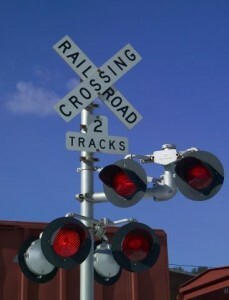 While both the National Tank Truck Carriers and American Trucking Associations prefer that appropriate signs should be added to the 21,000+ railroad crossings across the country where it’s not possible for a driver to pass through completely without stopping, the PHMSA and the FMCSA have stated that they do not have the authority for such a mandate. There’s been some grumbling that it’s not always easy to know ahead of time when a route is appropriate or not and that certain routes might not have appropriate detour routes especially in extremely industrial or port areas. The good news is that officials recognize that these issues can happen and they even suggest that enforcement of the rules shouldn’t be iron clad 100% of the time, but should be enforced at discretion based on the circumstances. Another effort to help hazmat drivers obey the new rule comes in the form of a free mobile app that can be used by any iPhone or iPad. The Federal Railroad Administration created the Rail Crossing Locator app to help provide hazmat-friendly routes to drivers, as well as a clear understanding of the grade crossings that were known. 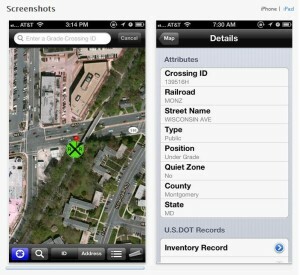 The app can locate crossings by Crossing ID, address, or geo-location. Crossings can also be identified by special characteristics. Users can also check accident history for each crossing.